Have you heard of Me Made May? It inspires a surge of garment sewing during the month of May. I often have vague ideas of making myself a blouse, a skirt or a dress, but these things never come to be because other projects are tantalizingly easy to start. Quilts and clothes for Rora are more accessible - I have the materials on hand - and risk free - I'm confident they'll turn out well. Sometimes we all need a push to work on the edges of our comfort zone. Even though May is halfway flown, I'm still going to take advantage of all the inspiration swirling through social media to launch some "me made" projects. I'm in the process of choosing fabrics and finalizing patterns. Here's what I have in mind. Let's make it official! I tend to wear the same 1-2 dresses in warm weather. The others just gather dust. If only I could find a flattering and comfortable style I can sew! I have my eye on the Staple Dress. It looks like it might fit like one of my real-life favorites. Last year I learned I love wearing rayon. I'm wondering if Paint Roses Orange by Rifle Paper Company (a rayon) would be too loud on me? I love the print, but will I really wear it in red? My favorite dresses are navy prints. That's nice and all, but I want to add some variety to my wardrobe! I've had lots of success with sewing skirts. One of my favorites is this voile number, which I embellished as part of Handstitched class. I'll make another in the same pattern, Proper Attire by Anna Maria Horner, but without embellishments. The dropped yoke style of this pattern is slimming. For the fabric, I've fallen in love with the map print from Art Gallery's Meditteraneo collection. I just have to settle on a lining fabric. Last time I used muslin. Is that weird? I like something soft rather than silky for a skirt lining. Last year I had great success sewing a Made by Rae Josephine blouse. I'm considering another one of her patterns called Ruby. I like that Ruby allows for a contrast fabric to be used as the yoke. I'm thinking rayon for the body and perhaps a simple tonal print for the yoke? Shown is Mediterraneo shell blaze in night. I actually love the cream yoke fabric in the sample top. Wish I could find that in black! Do you sense a Mediterraneo theme? 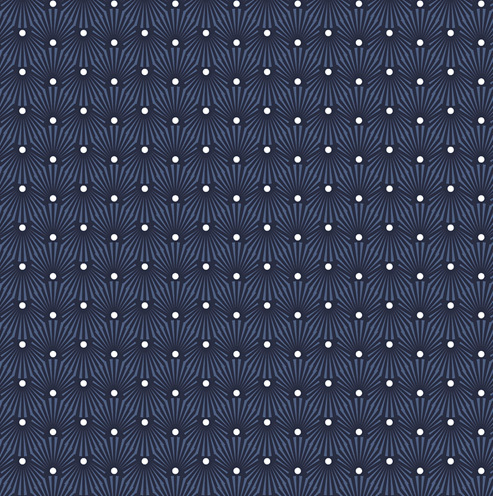 Yes, I'm pretty smitten with the collection recently released by Art Gallery Fabrics. Instead of going with my default (quilt), I'm trying to stretch myself to wear some of it! What about you? Any plans to make yourself some clothing this year? Or, are you already wearing handmades this May?